Status: Inactive; Active 1963-1971. Born: 1932-03-16. Spaceflights: 1 . Total time in space: 10.84 days. Birth Place: Creston, Iowa. BIRTHPLACE AND DATE: Cunningham was born in Creston, Iowa, on March 16, 1932. EDUCATION: Cunningham received a Bachelor of Arts degree with honours in physics in 1960 and a Master of Arts degree in physics in 1961 from the University of California at Los Angeles. He attended the Advanced Management Program, Harvard School of Business, in 1974. EXPERIENCE: Cunningham joined the Navy in 1951 and began flight training in 1952. He joined a Marine squadron in 1953 and served with the Marine Corps until 1956 and in the Marine Corps Reserve until 1975. He held the rank of Colonel, USMC (retired). After receiving his MS degree from UCLA, Cunningham worked as a scientist with the RAND Corporation. 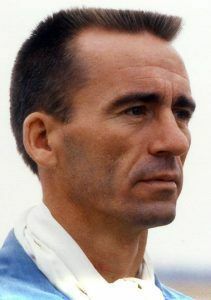 NASA selected him as an astronaut in October 1963. On October 11, 1968, he, Commander Walter Schirra and Command Module pilot Don Eisele were launched aboard Apollo 7 - the first flight test of the redesigned Apollo after the first crew died in the Apollo 1 launch pad fire on January 27, 1967. The flight was a complete success and provided NASA with confidence to send the next Apollo crew, into orbit around the moon. However the crew suffered head colds and had numerous arguments with ground controllers. NASA management secretly decided that none of them would be allowed to fly in space again. Cunningham retired from NASA in 1971 and published a book of his experiences as an astronaut, The All-American Boys. He later was president of Acorn Ventures. Family: Astronaut. Country: USA. Flights: Apollo 204, Apollo 205, Apollo 7. Projects: Apollo. Agency: USMC. Bibliography: 4478, 5299. 1932 March 16 - . Birth of Ronnie Walter 'Walt' Cunningham - . Nation: USA. Related Persons: Cunningham. American pilot astronaut 1963-1971. 1 spaceflight, 10.8 days in space. 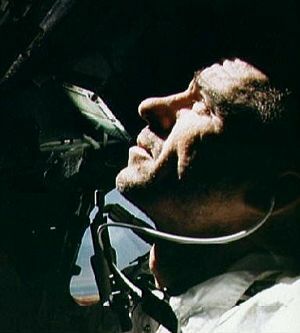 Flew to orbit on Apollo 7 (1968)..
1963 June 5 - . 10 to 15 new astronauts to begin training in October - . Nation: USA. Related Persons: Aldrin, Anders, Bassett, Bean, Cernan, Chaffee, Collins, Cunningham, Eisele, Freeman, Gordon, Schweickart, Scott, Williams, Clifton. Program: Apollo. NASA announced that it would select 10 to 15 new astronauts to begin training in October. Civilian applications were due July 1; those from military personnel, prescreened by their services, were due July 15. New selection criteria reduced the maximum age to 35 years and eliminated the requirement for test pilot certifications. 1963 October 17 - . NASA Astronaut Training Group 3 selected. - . Nation: USA. Related Persons: Aldrin, Anders, Bassett, Bean, Cernan, Chaffee, Collins, Cunningham, Eisele, Freeman, Gordon, Schweickart, Scott, Williams, Clifton. The group was selected to provide crew members for planned Apollo missions (then planned as 4 Saturn I missions in 1965, 2-4 Saturn IB missions in 1966, 6 Saturn V missions from 1967).. Qualifications: Qualified jet pilot with minimum 1,000 flight-hours, bachleor's degree in engineering or physical or biological sciences, under 35 years old, under 183 cm height, excellent health. US citizen.. There were 271 applications, 200 from civilians (including two women) and 71 from military pilots (including two African-Americans). President Kennedy pushed for NASA to appoint a black astronaut, but neither of the applicants met the test pilot requirements. Bobby Kennedy arranged for one of these, USAF Captain Edward Dwight, to be enrolled in the USAF Test Pilot school. He graduated, and then had the necessary qualifications. He was 28 years old, an engineering school graduate, and a B-57 bomber command pilot with 2,000 hours flying time. However NASA did not find him as well qualified as other candidates, and he was not among the 32 chosen for final physical and mental tests. From these 32, the final 14 were selected. Of them, four would die (two in a T-38 crash, one in a car crash, and one in the Apollo 204 ground fire) before flying in space. All of the ten remaining would fly in the Apollo program. 1963 October 18 - . Selection of 14 astronauts for Projects Gemini and Apollo - . Nation: USA. Related Persons: Aldrin, Anders, Bassett, Bean, Cernan, Chaffee, Collins, Cunningham, Eisele, Freeman, Gordon, Schweickart, Scott, Williams, Clifton. Program: Apollo. Spacecraft: Gemini. NASA announced the selection of 14 astronauts for Projects Gemini and Apollo, bringing to 30 the total number of American spacemen. They were Maj. Edwin E. Aldrin, Jr., Capt. William A. Anders, Capt. Charles A. Bassett II, Capt. Michael Collins, Capt. Donn F. Eisele, Capt. Theodore C. Freeman, and Capt. David R. Scott of the Air Force; Lt. Cdr. Richard F. Gordon, Jr., Lt. Alan L. Bean, Lt. Eugene A. Cernan, and Lt. Roger B. Chaffee of the Navy; Capt. Clifton C. Williams, Jr., of the Marine Corps; R. Walter Cunningham, research scientist for the Rand Corporation; and Russell L. Schweickart, research scientist for MIT. 1964 February 3 - . Fourteen new astronauts reported for training - . Nation: USA. Related Persons: Aldrin, Anders, Bassett, Bean, Cernan, Chaffee, Collins, Cunningham, Eisele, Freeman, Gordon, Schweickart, Scott, Williams, Clifton. Program: Apollo. Spacecraft: Gemini. Fourteen new astronauts, chosen in October 1963, reported at MSC for training for the Gemini and Apollo programs..
1965 February 16 - . Specialty areas for 13 astronauts not assigned to Gemini - . Nation: USA. Related Persons: Aldrin, Anders, Bassett, Bean, Cernan, Chaffee, Collins, Cunningham, Eisele, Freeman, Gordon, Schweickart, Scott, Williams, Clifton. Program: Apollo. Spacecraft: Apollo LM, CSM ECS, LM Communications, LM ECS, LM Guidance. Clifton C. Williams - range operations, deep space instrumentation, and crew safety. Russell L. Schweickart - in-flight experiments and future programs. 1966 September 29 - . Second planned manned Apollo flight crew was named by NASA - . Nation: USA. Related Persons: Borman, Collins, Cunningham, Eisele, Schirra, Stafford. Program: Apollo. The second planned manned Apollo flight crew was named by NASA. Prime crew members were Walter M. Schirra, Jr., command pilot; Donn F. Eisele, senior pilot; and R. Walter Cunningham, pilot. Backup crewmen were Frank Borman, command pilot; Thomas P. Stafford, senior pilot; and Michael Collins, pilot. The flight was scheduled for 1967. It would be the first space mission for Eisele and Cunningham. Apollo 205 (cancelled) - . Crew: Cunningham, Eisele, Schirra. Backup Crew: Borman, Collins, Stafford. Payload: CSM-014. Nation: USA. Program: Apollo. Flight: Apollo 205. Spacecraft: Apollo CSM. It was originally planned to make a second solo flight test of the Block I Apollo CSM on a Saturn IB. The flight was finally seen as unnecessary; the decision to cancel it came on November 16, 1966. After the Apollo 1 fire on January 27, 1967, the Schirra crew was assigned to Apollo 7, the first manned flight test of the new Block II Apollo CSM-101. 1968 October 11 - . 15:02 GMT - . Launch Site: Cape Canaveral. Launch Complex: Cape Canaveral LC34. LV Family: Saturn I. Launch Vehicle: Saturn IB. Apollo 7 - . Call Sign: Apollo 7. Crew: Cunningham, Eisele, Schirra. Backup Crew: Cernan, Stafford, Young. Payload: Apollo CSM 101 / S-IVB-205. Mass: 14,674 kg (32,350 lb). Nation: USA. Agency: NASA Houston. Program: Apollo. Class: Moon. Type: Manned lunar spacecraft. Flight: Apollo 7. Spacecraft: Apollo CSM. Duration: 10.84 days. Decay Date: 1968-10-22 . USAF Sat Cat: 3486 . COSPAR: 1968-089A. Apogee: 306 km (190 mi). Perigee: 229 km (142 mi). Inclination: 31.60 deg. Period: 89.90 min. Apollo 7 (AS-205), the first manned Apollo flight, lifted off from Launch Complex 34 at Cape Kennedy Oct. 11, carrying Walter M. Schirra, Jr., Donn F. Eisele, and R. Walter Cunningham. The countdown had proceeded smoothly, with only a slight delay because of additional time required to chill the hydrogen system in the S-IVB stage of the Saturn launch vehicle. Liftoff came at 11:03 a.m. EDT. Shortly after insertion into orbit, the S-IVB stage separated from the CSM, and Schirra and his crew performed a simulated docking with the S-IVB stage, maneuvering to within 1.2 meters of the rocket. Although spacecraft separation was normal, the crew reported that one adapter panel had not fully deployed. Two burns using the reaction control system separated the spacecraft and launch stage and set the stage for an orbital rendezvous maneuver, which the crew made on the second day of the flight, using the service propulsion engine. Crew and spacecraft performed well throughout the mission. During eight burns of the service propulsion system during the flight, the engine functioned normally. October 14, third day of the mission, witnessed the first live television broadcast from a manned American spacecraft. 1968 October 22 - . Landing of Apollo 7 - . Return Crew: Cunningham, Eisele, Schirra. Nation: USA. Related Persons: Cunningham, Eisele, Schirra. Program: Apollo. Flight: Apollo 7. The SPS engine was used to deorbit after 259 hours 39 minutes of flight. CM-SM separation and operation of the earth landing system were normal, and the spacecraft splashed down about 13 kilometers from the recovery ship (27.32 N 64.04 W), the U.S.S. Essex at 11:11 GMT. 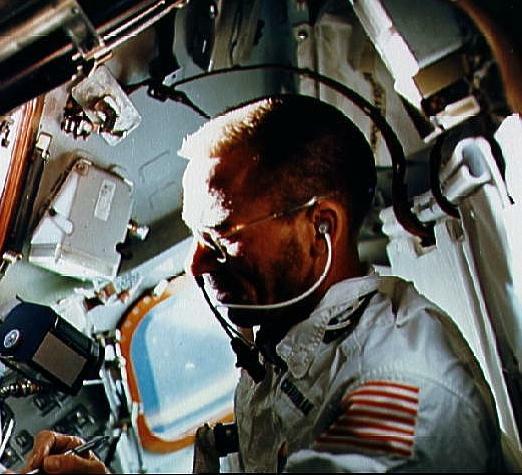 Although the vehicle initially settled in an apex-down ("stable 2") attitude, upright bags functioned normally and returned the CSM to an upright position in the water. Schirra, Eisele, and Cunningham were quickly picked up by a recovery helicopter and were safe aboard the recovery vessel less than an hour after splashdown. All primary Apollo 7 mission objectives were met, as well as every detailed test objective (and three test objectives not originally planned). Engineering firsts from Apollo 7 , aside from live television from space, included drinking water for the crew produced as a by-product of the fuel cells. Piloting and navigation accomplishments included an optical rendezvous, daylight platform realignment, and orbital determination via sextant tracking of another vehicle. All spacecraft systems performed satisfactorily. Minor anomalies were countered by backup systems or changes in procedures. With successful completion of the Apollo 7 mission, which proved out the design of the Block II CSM (CSM 101), NASA and the nation had taken the first step on the pathway to the moon. Although the systems worked, the crew became grumpy with head colds and talked back to the ground. As a result, NASA management determined that none of them would fly again. Apollo 7 landed at 07:12 GMT.